I’m not normally a loosey goosey plotter, but I seem to be for the book I’m currently writing. This time, I plotted out the main plot kernels for each chapter, but I didn’t really flesh things out. It’s pretty bare bones on that outline! When I’m throwing together my plot, if I leave a spot a little bare, I tell myself, “It’s okay, I’ll sort it out when I get to it.” Well, I just got to one of those places, and I have to tell you–it’s annoying! I’ve got a scene all prepped and ready to roll, but I’m not entirely sure what Important Thing is going to be discovered in this scene. I can’t just toss my characters together for no good reason. This isn’t a Friends episode. This is a novel. There have to be reasons that run deeper than the character’s whims. There has to be importance on the author level, too. 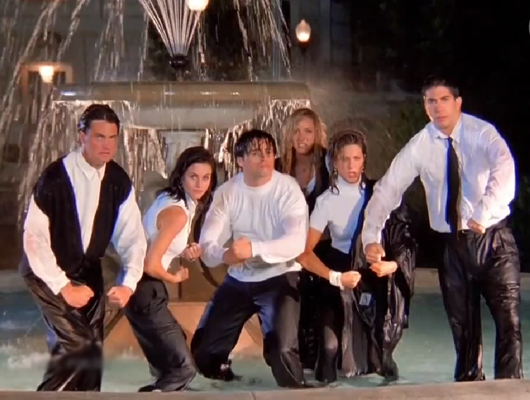 Get out of that silly fountain unless it’s going to further the plot, people! And that, dear reader, is why I love this man. He’ll lay in bed with me while I expound upon the plot and various motives of my characters. He’ll stare at a dark ceiling with me. He’ll help me sort out my plot holes. And then… after all of that unromantic business of book plotting, while we’re still laying in the dark and he can’t see me at all… he’ll tell me I’m pretty.